Saturday 26th May, 3.25pm, Festival of Suffolk Poetry |New Word, Fresh Voices from the Seagull theatre. The John Peel Centre, Stowmarket. £10. Sunday 6th May, 12.00 pm A Kind of Stupidity | Dove Tales. Wigtown Spring Book Weekend. Dove Tales is a new peace charity which uses the arts to oppose the arms trade and to question the increasing militarization of our society. This event features readings from A Kind of Stupidity, our new anthology of poems and prose about war. Friday 17th November, 7pm: Cafe Poets at Pinky’s. I will be reading some of my poems along with a good crowd of local poets at the last Cafe Poets of 2017! Free. Sunday 12th November, 7.30pm: New Words Fresh Voices. I will be presenting some of my original music & poetry, together with Martin Lovett and Josephine Horne. £4. Sunday 5th November, 11.30am: Poetry in Aldeburgh. I will be reading some of my own work along with that of Amit Chaudhuri. Tiffany Atkinson will be reading at the same event, ‘Writing/Rioting,Nightrunning’, part of Poetry in Aldeburgh , the evolution of the Aldeburgh Poetry Festival. £7. Friday 24th October: Launch:Relaunch, 7pm – Tell It Slant poetry bookshop in the Project Cafe, 134 Renfrew St, Glasgow. Reading with other contributors at the launch of fourfold 4, Juana Adcock, Jim Carruth, Hazel Frew, and Mark Russell, and at the relaunch of the bookshop under its editor Kathrine Sowerby. Friday 12th September: Stone Tape gig, 8pm – Old Hairdressers – with Big Hogg, No More Tiger, & Tom Snowball Band. £5 entry. Wednesday 3rd September, 4-7pm: Govan and Craigton Integration Network AGM – Kinning Park Complex, 43 Cornwall Street, G41 1BA. Refugee and asylum seeker integration charity celebration – poetry, dancing, music and food. Sunday 24th August, 12 noon: Doune the Rabbithole Festival – Spoken Word Tent. Friday 15th August, 9pm – VOM, House of Snakes & Stone Tape – music gig @ 13th Note, Glasgow. Thursday 10th July, 8pm – Auld Enemies Tour with Jim Ferguson, combining Scots song by Robert Tannahill with poems from A Bird is Not a Stone. Other poets include Ryan Van Winkle, Nalini Paul, JL Williams, Katy Hastie, Calum Rodger, Billy Letford & Colin Herd. McChuill’s Bar, Glasgow/ Fail Better. Thursday 12th June, 7pm – Poetry in the Park with Glasgow Woman’s Library, in Kelvingrove Park, at An Clachan. I will be reading with Magi Gibson, Sheila Templeton, Leela Soma, and Nicola Burkhill . Wednesday 30th April 2014, 8pm – Music – Stone Tape will be providing musical interludes for the Village Storytelling Centre at the Glad Cafe, 1006a Pollokshaws Road, Glasgow G41 2HG. Thursday 13th March 2014, 8pm – Music – McAteer & McAteer will be singing a mix of Blues and contemporary compositions at Fail Better, McChuill’s pub, High St, Glasgow, alongside SHAMBLES MILLER, & BOBBY NICHOLSON. Wednesday 5th March 2014, 6pm – Words – The last supper – poetry launch night – The Record Factory, 17 Byres Road, G11 5RD Glasgow. Free food! Wednesday 12th February 2014, 8pm – Music – Jim Ferguson – Songs to Drown a Million Souls – Book Launch – with Paul Tasker & Jim McAteer, Scotia Bar, Glasgow. Tuesday, 19th February, 7pm – Music – Stone Tape will be playing at Tchai Ovna, along with My Lady of Clouds and Ceylan Hay. Tuesday, 15th January, 6pm – Music – The Rio Café, 27 Hyndland Street, Glasgow, G11 5QF. Wednesday, 9th January, 7pm – Words – Headlining at Poetry @ the Ivory, 2 Camphill Avenue Glasgow, G41 3AY. Friday, 14th December, 8pm – Music – Short set at The Vagabond Social Club Winter Festivus, an annual madness from the Vagabond Social Club. With The Dirt, Craig Hughes, Jim Dead, Craig McClure and Jim McAteer. Thursday, 6th December, 9pm, Free – Stone Tape are the featured act at the Open Minded Open Mic, McChuill’s Bar, High St, Glasgow. Thursday, 8th November, 9pm, Free – The Handsome Cadavers, MacSorley’s Music Bar, Jamaica St, Glasgow G1 4QG. Myself, brother Jim and Kirstie of Stone Tape fame have been recruited to the band for their first gig! Sunday, 26 August – Easy, Tiger! at Doune the Rabbit Hole, 1.45pm, Baino Tent Saturday, 25 August – Spoken Word at Doune the Rabbit Hole, 8.30pm. Ellen McAteer will be performing poetry on The Longhouse Spoken Word Stage, and singing with the band Easy, Tiger! at the Baino Tent at the Doune the Rabbit Hole festival in Carron Valley. 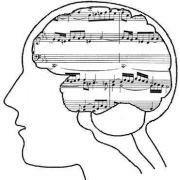 https://www.facebook.com/events/477818888895029/ 26th July – Words and Music – The Open-Minded Open Mic! 9pm, Mchuill’s, Glasgow. This will be a Merchant City Festival Special. Stone Tape will be out in force at this, along with the odd Easy, Tiger! 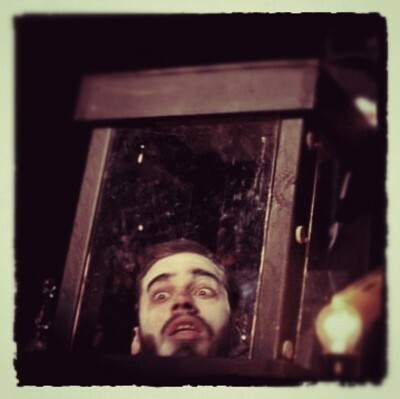 and the occasional Handsome Cadaver! 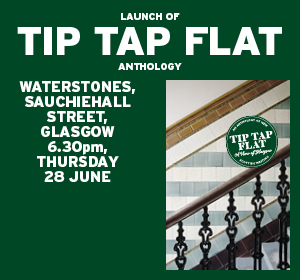 Yours truly will be hosting… 28th June – Word – Launch of Tip Tap Flat Glasgow Uni & GSA Anthology at Waterstones, Sauchiehall St, Glasgow. 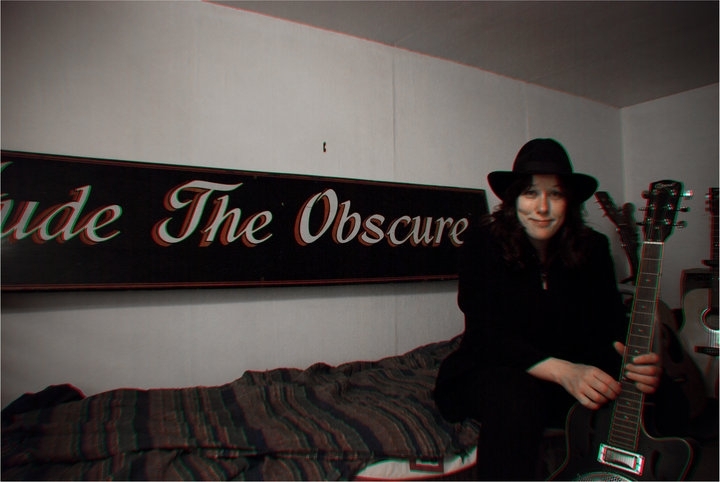 16th June – Music – with The Stone Tape at Listen In Lights Out 14. The Go Slow Cafe, Victoria Road, Glasgow. 4th May – Music – Listen In Lights Out 13 – musical delights by candlelight. The Go Slow Cafe, Victoria Road, Glasgow. 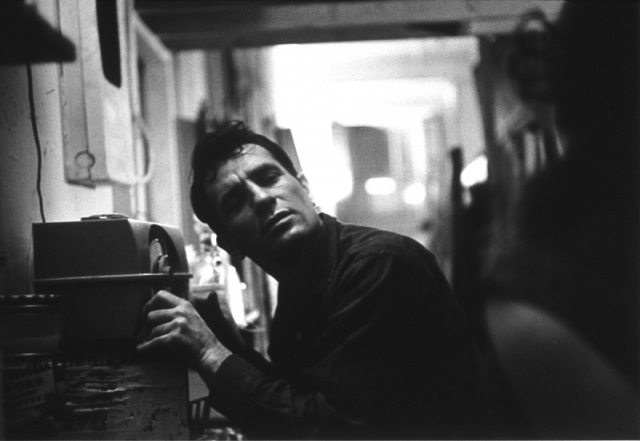 1st April – Word – Dharmic Angels showcase for Jack Kerouac’s 90th birthday year, No Rhyme, No Reason, Jazz Bar, Chambers St, Edinburgh, from 8.30pm. 13th March – Word – Ayewrite Poetry corner, Mitchell Library, Glasgow. St Mungo’s Mirrorball regular showcase. 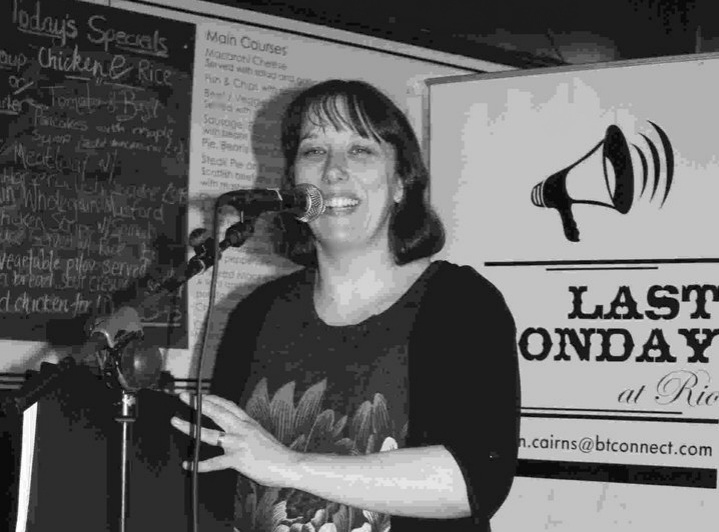 27th Feb – Word – Last Monday at the Rio Cafe, 8pm, 27 Hyndland Street, Glasgow. Headline poets are Jon Sands and Ken Arkind.